If you are planning a fundraiser in the near future, you could use this Donation Pledge Form to keep track of the donations that are being made. It is free to download here and extremely easy to use. You will have them ready in no time and be passing them out to the participants. Here is an easy to follow guide showing you what to do and a couple of tips to help your event. Download this small file to your computer and open it up. Microsoft Word 2013 or any other software that recognizes the file type should show you the basic outline for your Donation Pledge Form. The first three things you can change are all grouped together at the top. Replace [Organization Name] with the name of the company and put your motto where the document has [Mission statement]. To the left of that, delete the picture that is present and replace it with the logo of the organization. The body of the document is ready to go and does not need any editing. The bottom right of the form has a place you can insert the date, the organization’s name, and address of the business. Once all of that information is entered, you have a solid Donation Pledge Form. You can print out as many as you want and use them. There is not much changing you can do to make it better. The makers did a really good job of leaving a spot for any information that the person making the donation would need to give the people taking the donations. 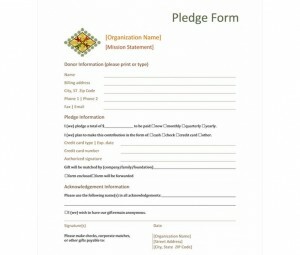 If you would like, you could write a letter on the back to anyone that receives this pledge form stating what money is being raised for and any information that they may need to know about the events you plan to recognize those who contributed. Feel free to add anything you like that you think might help generate donations. This Donation Pledge Form is so easy to use and can be completed in no time. Download it below and get started right away. You can be out requesting donations in no time.